New York Travel is best known in conjunction with the "Big Apple," New York City. But, New York State is so much more than that vibrant city. New York spans from the Great Lakes to the east coast with mountains, lakes, historic cities, and picturesque wine country. New York State is home to over 19 million residents, over one-third of whom live in Greater New York City. Outside of New York City, you'll find peaceful mountain aeries, fascinating natural wonders such as Niagara Falls, cultural meccas like Chautauqua, and wonderful wineries along the Great Lakes and in the [New York Travel - The Finger Lakes|Finger Lakes]] region. 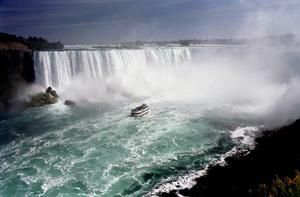 One of the most visited spots in New York is Niagara Falls. This picturesque locale, just north of Buffalo has been popular with honeymooners and other sightseers for over one hundred years. Visitors can experience the Falls in a variety of ways -- by taking the "Maid of the Mist" cruise under the Falls, by hiking into the caves carved out behind the Falls, or at one of the many viewing sites located among the acres of New York State Park land that surround the natural wonder. Buffalo, in western New York at the eastern edge of Lake Erie, is known for its heavy snowfalls, popular football team, and spicy chicken wings. (Yes, Buffalo wings come from Buffalo, New York, not the animal.) It is also the home of whipped cream, Betty Crocker foods, Cheerios, and Sorrento cheeses. Attractions in the city include the Albright-Knox (modern) Art Gallery, several Frank Lloyd Wright-designed homes, and Delaware Park, designed by Frederick Law Olmsted and said to be his model for New York City's Central Park. 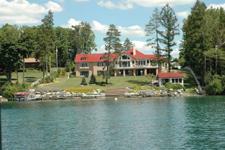 The Finger Lakes offer visitors a serene and relaxing New York travel experience. Located in upstate New York, the region is named for the many narrow glacially formed lakes that resemble "fingers" in shape. The area is popular as a vacation retreat for east coast city dwellers as well as for its excellent wines, particularly Icewines. Albany, New York's capital, was founded in 1694 and is one of the state's oldest cities. Situated along the Hudson River, Albany is, today, home to around 100,000 residents. Attractions in the city include the ornate State Capitol building, designed after Paris' Hotel de Ville; the "Egg," an egg-shaped performing arts center; and the Empire State Plaza, a striking mixed use facility in the heart of downtown. Other popular New York destinations include the Adirondack Mountains in northeastern New York. These picturesque hills and adjacent lakes are the site of the fabulous "summer camps," built by late 19th century New York industrialists as escapes from the city. Many of these second homes were larger than the homeowner's city dwelling, and their clever use of logs, bark, stone, and other natural elements inspired an entire school of design. Ithaca, in central New York, is a tree-lined college town, home to Cornell University and an active cultural center. Long Island, along the Atlantic coast, east of New York City, is the playground of weekend escapees from New York City and the "Hamptons" are popular with the celebrity and moneyed crowd. The north shore of Long Island, the "Gold Coast" has been the bastion of old money since the days of the 19th century industrialists. Theodore Roosevelt had a home there, as did Franklin Roosevelt later. It was also the site of F. Scott Fitzgerald's tragic novel, "The Great Gatsby."